I just finished watching Personal Taste/Preference, and I have such strong feelings about it that I'm skipping the other two reviews I've been working on (Rooftop Prince and A Gentleman's Dignity) to get this one off my chest. The best analogy I can think of for this drama is when you get to the bottom of a bag of popcorn and you have those half-popped kernels that you eat because they're kind of popcorn-y, but the whole time, you're fully aware that it would be a million times more satisfying if you had just let it cook another 20 seconds. 1. Lee Min Ho: Obviously. I was never crazy about him in Boys over Flowers (the crazy poodle hair didn't help), and I haven't gotten around to listening to Coco's rave reviews and watching City Hunter yet, but I'm sold after this drama. He was dashing and charming and every bit the Korean Ryan Gosling that Coco has been calling him all this time. 2. The story (part 1): I thought that the basic story of a guy pretending to be gay was different and interesting, and the episodes where he fills the role of her "gay best friend" were some of the strongest and funniest in the entire series. Watching him try to buy tampons in front of giggling schoolgirls had me laughing out loud. I wish they had played up that element of the story for longer. 3. The "Game Over" kiss: Wow, Lee Min Ho has come a looooong way since his frozen-faced BoF days. Nothing petrified or awkward about this one. 4. Chairman Choi: I enjoyed a lot of the minor characters, but he deserves a special shout-out for being so well-rounded and empathetic and just human. 1. The story (part 2): While I'm usually the first one to defend dramas that give the main couple some cute time together after they finally kiss, this one went downhill pretty fast. It wasn't nearly as funny, and I found myself fast forwarding just to see what would happen in the last few episodes. That was kind of a letdown after the strong middle. happened after her makeover? Is the circus in town? Note: Stop reading here if you don't want to know what happens in the end. I warned you! Thar be spoilers here! Even though I really liked his character and he actually treated her well, this ruined it for me because it didn't matter. He literally could have been a serial killer or a pest control salesman, and she would have taken him back anyway. Sigh. So many things I loved! So many things I threw at my computer out of frustration! Note: After a recent layout switch, we're seeing comments posted before April 7, 2017 missing on a few posts. We're working on a solution, and in the meantime, any new comments you leave will work! OMG, so on point! Had the same feeling-though I have to admit the GO-kiss pushed me a little closer to the "Luv it" side. I have to agree with you with the bed scene, hahaha :) I also hate it. I came back to your review of this after rewatching some of my favourite scenes from the series. That climax gets more and more indefensible with every viewing, sadly. 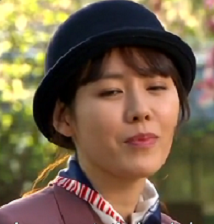 On a shockingly superficial note, I am ever more distressed at how hard they worked to uglify Son Ye Jin. She is a strikingly attractive woman, with a distinctive beauty but it seems they went out of their way to make look as unattractive as possible, perhaps to explain her character's total lack of self-respect. Time to watch Summer Scent, I think. that bad scene is actually kind of disappointing. I mean I thought they were willing to wait until they got married because Gae-In has princples and Jin Ho respects Gae In so much. but I guess they're just too excited. Oh well, I was still happy that their was closure for everyone in the ending. Time to wait for Heirs :) love your blog btw. Ha, it made it even worse because she didn't even seem excited! She was crying! Here's hoping Heirs handles the romance a little better! Totally agree. The final scene was revolting. She was the one to go back to him. He never got the courage to face his mistakes. And that bed scene was disgusting :( worst end ever! Ohhhhhhh, I agree with so much of this. So much of this!!!! Two blonde American girls by day, Korean drama addicts by night--think of us as your new kdrama advice-giving best friends. With drama reviews and an outsider's perspective on cultural clues, our Korean drama blog will help you reach kdrama bliss. So get out there and start watching. Fighting! Why Do They Say "Fighting!" in Korean Dramas? ©KdramaFighting, 2013. All content and images property of KdramaFighting unless otherwise noted. Please do not use without permission and proper attribution.